Sensitiv Imago® Angel is a new module that was created to expand the possibilities of Sensitiv Imago 130 and 530 in the areas of the energy protection of your life environment (your offices and homes), neutrolization of electro-smog, all kinds of EMF's from computers and gadgets, effects of geo-pathogenic zones. Sensitiv Imago® Angel is able to protect the energy field of operator and thus, is suitable for doctors, therapists, naturopaths and other practitioners working in holistic medicine for use during diagnostics, bio-energetic testing and frequency compensation. 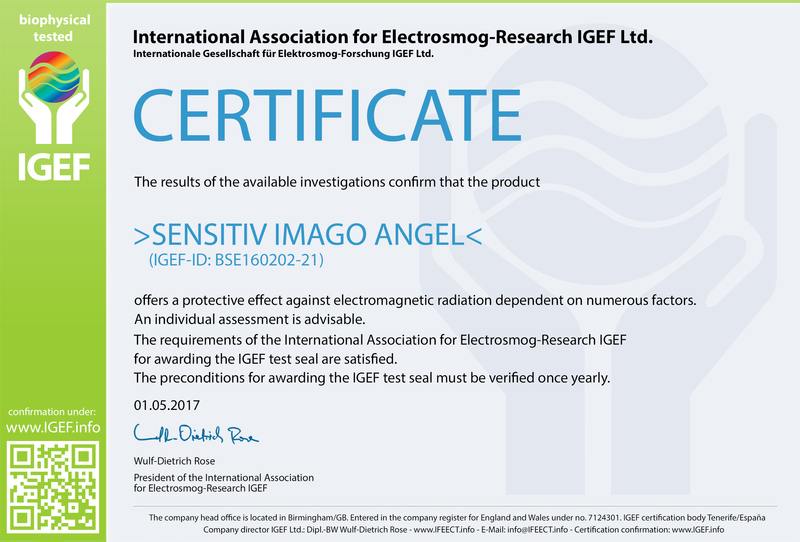 Sensitiv Imago® Angel can also be used by all those who want to get rid of the negative impact of everyday electromagnetic smog. Cleaning our working and living environment from electromagnetic smog can help eliminate many of the health problems and contributes to remedy the psycho-social difficulties in the family and at work. Sensitiv Imago® Angel can even help harmonize your plants (home and garden) and also have a positive effect on your pets. Sensitiv Imago® Angel can reliably offset and then completely remove the adverse effects of geo-pathogenic zones, psychosomatic zones, water crisis, Curry and Hartmann bands, including electrosmog. In addition, it eliminates other negative influences that affect cellular structure of the physical body. 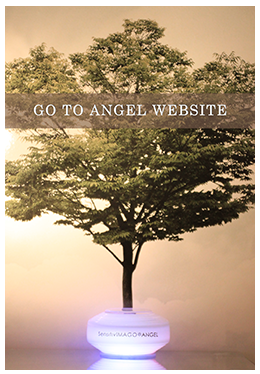 Sensitiv Imago® Angel serves to improve the overall harmonization of the body and mind. As a result, it contributes to harmonizing family relationships, improving metabolism and the quality of sleep. It is important for cleaning home and work environments. In practice, the Sensitiv Imago® Angel device achieves excellent results, both by itself and in cooperation with Sensitiv Imago® 500C (530C) and 100c (130c) when after deployment of Sensitiv Imago® Angel, an overall harmonization and improvement of patient’s health status was observed. Sensitiv Imago® Angel is designed to generate and support a healthy environment in the room (at work and home conditions), which is achieved due to oscillations from gemstones and differently colored LEDs. The frequency range in which the individual minerals "vibrate" is balanced according to the optimal focus that enables effective environment cleaning by Sensitiv Imago® Angel. It was established that specific minerals vibrating in their specific ranges are able to create a mutually supportive vibration that naturally tunes in the environment - be it geopathogenic zones or other influences which also vibrate in a certain frequency range. Based on this principle, it becomes possible to diminish the effect of negative vibrations and to establish a harmonious environment for a long, happy and healthy life full of energy. 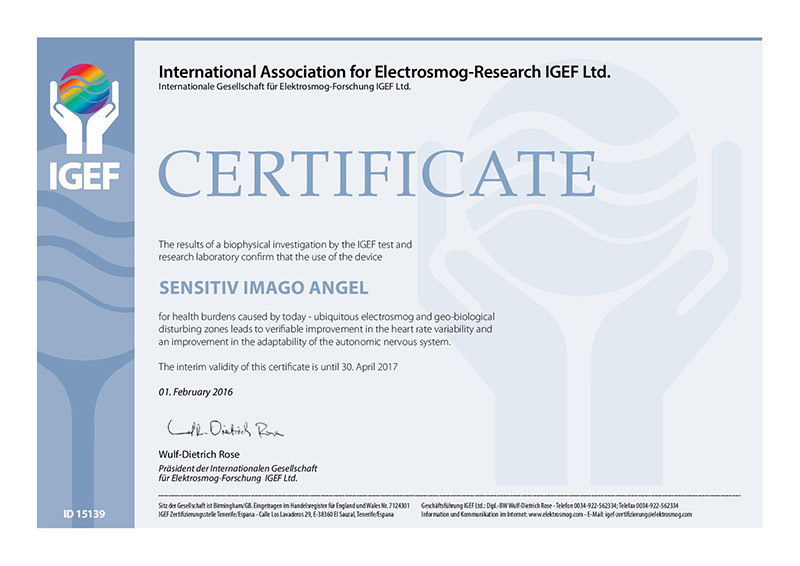 What is specifically important for us is the use of Sensitiv Imago® Angel in bioresonance centers where there is a permanent pollution of environment by all types of abnormal electro-magnetic effects, both residing in offices but also coming from clients. The result by Sensitiv Imago® Angel is much less fatigue for therapists and more accurate work with bioresonance devices. Effects from Sensitiv Imago® Angel instruments are individual and depend on several factors. The first changes as a result of work of Sensitiv Imago® Angel depend on the sensitivity and perceptions of each individual. Visible positive effects also depend on the severity of the disorder and its character. If the problem is acute, usually improving the state comes earlier than with chronic problems which need one to several months for a noticeable improvement. Some sensitive individuals feel the first effects almost immediately. You can feel the atmosphere change in the environment (the feeling of a clearer air), a greater sense of relaxation. Some individuals may experience a "adaptation period". It is caused by the device Sensitiv Imago® Angel acting on blockages in our body, which were dormant but now will begin to activate. Over time, Sensitiv Imago® Angel will have these blockages gradually degraded , negative feelings mitigated and eventually disappear altogether. This condition is always temporary. The principle of this reaction can be compared to various forms of detoxification. Sensitiv Imago® Angel is a gentle method with a long-term effect. During 3-6 weeks, it diminishes and eliminates geopathogenic load. During 1-3 months it diminishes and eliminates parasitic, bacterial, fungal and viral loads (depending on the diet regime and other factors). Furthermore, it improves metabolism and increase energy. After 3-6 months Sensitiv Imago® Angel has the environment completely cleansed. After this period, all users reported significantly higher levels of energy. From 6 to 12 months of use may lead to unwinding of some serious health problems and overall detoxification of the body. Sensitiv Imago® Angel was observed to create a positive impact on the following symptoms and complications: headache, rheumatic problems, stiff muscles, digestive problems, nerve disorders, trouble sleeping, nervousness, restlessness, fatigue, internal stress, heart disease or oncology disease. an improvement in the adaptability of the autonomic nervous system.